Don't you love it when a festive occasion falls on a weekend? Not an early or late observation of the event, but the honest-to-goodness real deal? This year, St. Patrick's Day is on a Saturday, meaning that there are going to be plenty of ways for revelers—whether they're Irish by blood or just in spirit—to have fun with the occasion. Here are just some of the places in Utah where you can wear your green, go bragh with Erin and let your shamrock flag fly. St. Paddy's Day gives those whose ancestors hailed from the Emerald Isle, as well as those who refer to themselves as being of honorary Irish descent, an excuse to celebrate a timeless tradition. That's especially true in our fair city, which has enjoyed its own gathering of the green, the popular annual St. Patrick's Day Parade. Dubbed "The Irish Are Coming: 40 Years of Shamrocks and Shenanigans," the parade still finds one of its four founders, John Welsh, taking an active role as its announcer. His daughter, Meghan Welsh-Gibson—vice-president of the Hibernian Society of Utah, the parade's primary sponsor—follows in her father's footsteps as the parade entry coordinator. 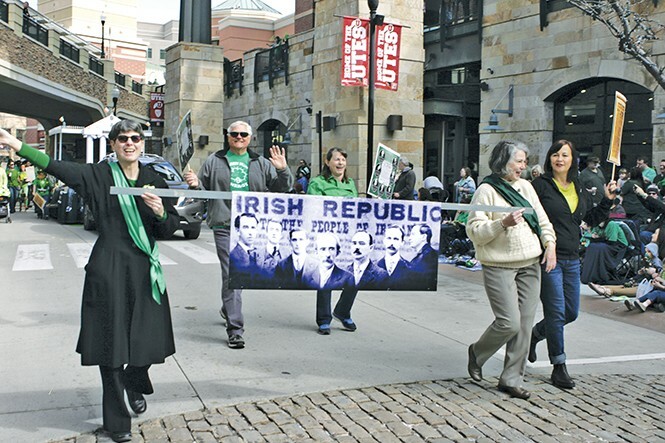 "This was a parade that was started by four friends who had a dream of making St. Patrick's Day more than just a day on the calendar," Welsh-Gibson says. "Their love of their Irish heritage is what has sustained this Salt Lake City tradition for 40 years.What started out as a parade with roughly a few hundred people lining the streets to watch, has turned into thousands of people that have come to love and anticipate this grand event every year." There's no reason to limit St. Paddy's Day festivities to the Irish alone. Their Scottish kinfolk also boast mirth and merriment of their own. That's one reason why the annual Celtic Celebration promises to provide such grand Gaelic entertainment. "The Peery's Egyptian Theater is truly the heart of local and regional entertainment for the Ogden/Weber area," says Ross Reeder, the theater's director of sales and marketing. "In partnering with LaRae Thackeray and her Celtic Beat Dancers, we have added to the many great bands that have performed over the years." Mountain West Cider—teaming up with Red Rock Brewery and Tullamore Dew—continues to help turn its particular corner of Salt Lake City's west side into a place for revelry, with this free admission post-parade extravaganza. Jump on the Tullamore Dew Party Trolley at the end of the parade route, which will bring you directly to the site of the event.